Ohio State University engineers are designing super-slick, water-repellent surfaces that mimic the texture of lotus leaves. The patent-pending technology could lead to self-cleaning glass, and could also reduce friction between the tiny moving parts inside microdevices. Scientists have long known that the lotus, or water lily, makes a good model for a water-repellent surface, explained Bharat Bhushan, Ohio Eminent Scholar and the Howard D. Winbigler Professor of mechanical engineering at Ohio State. The leaf is waxy and covered with tiny bumps, so water rolls off. Image: Scanning electron micrograph image of the surface of a lotus leaf. 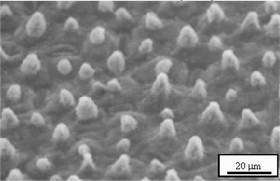 Ohio State University engineers are using the bumpy leaf as a model for slick, water-repellent surfaces. The species of lotus shown here is Nelumba nucifera. Image courtesy of Ohio State University. In studying the lotus leaf, Bhushan realized that the same texture could be exploited to reduce friction between moving parts on machines. Small machines, such as those under development in the fields of micro- and nanotechnology, can’t be lubricated by normal means, and would especially benefit from the technology. “In general, what’s good for water-repellency is good for fighting friction,” Bhushan said. But when it comes to designing high-tech surfaces -- for instance, a water-repellent car windshield or a low-friction joint on a micromachine -- just copying a lotus leaf isn’t enough. Bumpy, waxy surfaces can actually become sticky under some circumstances. “What people don’t know is what kind of surface is optimal,” he said. So he and his colleagues have built the first computer model that calculates the best bumpy surface for different materials and applications. With the right kind of texture, manufacturers could make self-cleaning windows. Because the bumps would measure only a few nanometers (millionths of a meter) high, and would be made of a transparent material, the window would look like any other but still repel water and dirt. That would mean less window cleaning in homes and businesses. So far, Bhushan’s team has focused on modeling bumps of different sizes and shapes. All the bumps included in the model aid water repellency by keeping water droplets from directly touching the surface. Because the bumps are so much smaller than a droplet and so close together, they can’t puncture the droplet. In fact, if the droplet were perfectly balanced, it would just lie on the bumps the way a person can safely lie on a bed of nails. Bhushan’s model calculates how and where to place the bumps so that the droplet will contact the surface in just the right way to roll off. In automobiles, water-repellent glass would improve safety by helping drivers see better, especially during inclement weather. Right now, drivers can spray coatings on car windows to accomplish much the same thing, but those coatings wear off. Because the new technology builds water-repellency into the surface of the window, it would continue to work for the lifetime of the window. Though drivers may rejoice at the idea of less window cleaning, Bhushan is most excited about what his technology could do for microelectronics. In 2001, his team developed the first direct method for measuring the friction between moving parts inside micromachines, and he has since been working on methods to reduce that friction. Some of Bhushan’s industrial partners are building light-based electronics in which tiny mirrors move to reflect light in different directions. Others are working on very small sensors that detect and process chemical samples. Both kinds of devices are too small to use traditional lubricants on the moving parts. One way to eliminate the need for lubricant is to build slick surfaces onto each individual part. Bhushan suspects his lotus-leaf surfaces might do the job. Manufacturers would just have to use his model to figure out what size and shape bumps are best for their application. Bhushan has been supporting this work with his own internal laboratory funds, and he’ll need an industrial partner to carry the work further. He wants to fabricate some very high-quality textured materials for scientific study, so he’ll have to buy time in a clean room facility -- the kind computer chip manufacturers use.